As part of my Campaign of Cheapness, I've been starting and finishing books off at the bookstore. This is the third book that I finished in the store over the past few months and I can't believe I never did this before. Combined, it's saved me over $50. I know, I sound like a cheap sonuvabitch, but were my employment situation any different I would of bought all of those books. Which brings us to Yes, You're Pregnant, But What About Me. 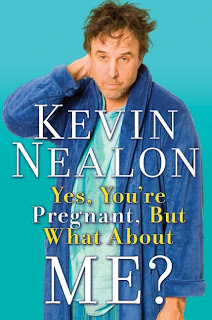 Over a year ago, Kevin Nealon was on Late Night with Conan O'Brien, and I remember he was there to plug this book. I usually enjoy his brand of humour and the title of the book made me laugh, so I added it to my "To Read" list. For those of you unfamiliar with him, he's most known for being a cast member on Saturday Night Live from the late 80's to 90's. His Hans and Franz sketch with Dana Carvey is probably his most famous bit. Also, he has a recurring role on the show Weeds and is in just about all of Adam Sandler's movies. The book is a biographical account of his journey into fatherhood. Being a celebrity and a first time father at such a late age (in his 50's), he shares his perspective on the whole experience leading up to the birth date. Nealon regales the readers with stories about past relationships, family, his previous marriage and his current marriage. The story that stuck to me the most was about his current wife. At the time they were dating, she was in her early 30's while he was in his early 50's. They had been dating only a week or two when one day he had a constipation problem. It was quite an emergency and he was in horrendous pain. So he called her to ask if she could go to the pharmacy to pick up laxatives and what not. So she goes, picks up the goods, and races back to his home while he's dying on the floor. Problem: she picked up the wrong goods. So she races back to the pharmacy and gets the "right" stuff this time... except no... she gets it wrong again. Kevin, dying on the floor sends her off again and FINALLY gets it right. The whole time he wonders what she must be thinking about her new boyfriend. At such a young age, how many of them suffered constipation problems. What would her friends think? It's not all full of silly stories like that. He also shares insight on what sorts of duties we as men should take as husbands and fathers. Sometimes he reminds me of myself; when asked to do something he doesn't want to do, in his head he'll be thoroughly convinced that he won't do it but he ends up doing it anyways. But that's a universal truth amongst us men right? It's a silly book and more heart-warming than I expected. It wasn't as laugh out loud as I had hoped it to be, but it was still entertaining. I think I would of enjoyed it more were I a father or an expectant father, so maybe I'll read this again years later when having a child becomes more of a reality.